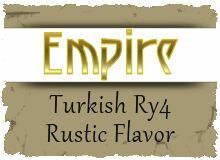 A complex blend of Turkish and Eastern Tobaccos that come together for a rich smooth blend. We've also introduced some RY4 elements into this eliquid to make it unique! Slightly sweet Turkish Tobacco with a warm smooth body and aromatic high notes, complimented by a blend of creamy Caramels for just the right amount of Sweetness. Exhaling thru your mouth gives you a sweeter Tobacco flavor while exhaling thru your nose provides a richer, bolder experience. This vape is sure to be the golden treasure of any Empire!